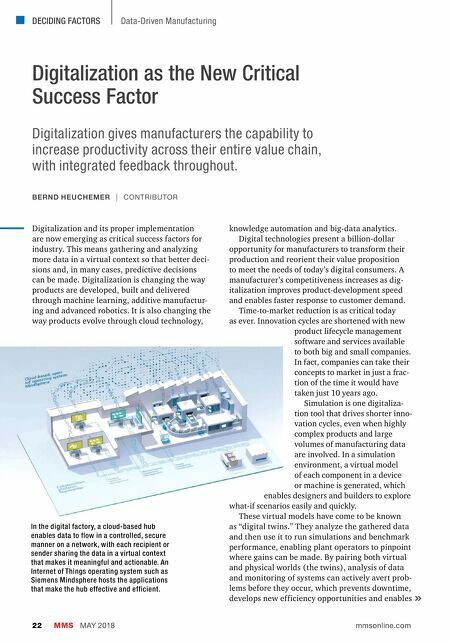 DECIDING FACTORS MMS MAY 2018 22 mmsonline.com Data-Driven Manufacturing Digitalization as the New Critical Success Factor Digitalization and its proper implementation are now emerging as critical success factors for industry. This means gathering and analyzing more data in a virtual context so that better deci- sions and, in many cases, predictive decisions can be made. Digitalization is changing the way products are developed, built and delivered through machine learning, additive manufactur- ing and advanced robotics. It is also changing the way products evolve through cloud technology, knowledge automation and big-data analytics. Digital technologies present a billion-dollar opportunity for manufacturers to transform their production and reorient their value proposition to meet the needs of today's digital consumers. A manufacturer's competitiveness increases as dig- italization improves product-development speed and enables faster response to customer demand. Time-to-market reduction is as critical today as ever. Innovation cycles are shortened with new product lifecycle management software and services available to both big and small companies. In fact, companies can take their concepts to market in just a frac- tion of the time it would have taken just 10 years ago. 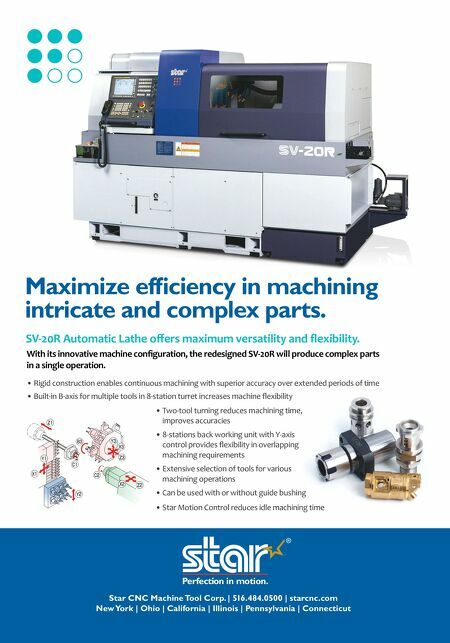 Simulation is one digitaliza- tion tool that drives shorter inno- vation cycles, even when highly complex products and large volumes of manufacturing data are involved. In a simulation environment, a virtual model of each component in a device or machine is generated, which enables designers and builders to explore what-if scenarios easily and quickly. These virtual models have come to be known as "digital twins." They analyze the gathered data and then use it to run simulations and benchmark performance, enabling plant operators to pinpoint where gains can be made. By pairing both virtual and physical worlds (the twins), analysis of data and monitoring of systems can actively avert prob- lems before they occur, which prevents downtime, develops new efficiency opportunities and enables BERND HEUCHEMER | CONTRIBUTOR Digitalization gives manufacturers the capability to increase productivity across their entire value chain, with integrated feedback throughout. In the digital factory, a cloud-based hub enables data to flow in a controlled, secure manner on a network, with each recipient or sender sharing the data in a virtual context that makes it meaningful and actionable. An Internet of Things operating system such as Siemens Mindsphere hosts the applications that make the hub effective and efficient.